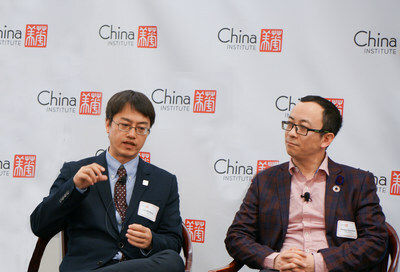 BEIJING, April 16, 2019 /PRNewswire/ — Liu Wenfeng, Chief Technology Officer of iQIYI, Inc. (NASDAQ:IQ) (“iQIYI” or the “Company”), recently participated in a panel discussion at the China Institute’s 2019 Executive Summit themed “Black and White: Technology as a Force for Good and Bad”, where he spoke about the value of AI to the entertainment industry and iQIYI’s advancements in AI innovation. Founded in 1926 by renowned scholars and educators, including Dr. John Dewey and Hu Shih, China Institute is the oldest non-profit organization in America solely dedicated to advancing a deeper understanding of China. The institute’s flagship event, this year’s Executive Summit ran under the theme of “The Next U.S.-China Frontier: Technology, Disruption, and Social Innovation”, gathering influential leaders in technology and science to discuss technology development in China and the U.S., cutting-edge technology trends, and the application of technology to achieve social innovation. At the summit, discussions evolved around the growing application of AI technology in everyday life, including the entertainment industry. On the outlook of AI technology in entertainment, Mr. Liu commented, “The arrival of the 5G era will provide a richer and more innovative form of display for entertainment content.” iQIYI has been integrating 5G and AI technology to explore the endless possibilities in the commercialization of 5G technology. In March 2019, the company announced its partnership with China Unicom to explore the commercialization of 5G technology by launching its 8K VR visual experience at China Unicom’s 5G Innovation Showroom in Beijing. With the support of 5G technology, users can enjoy an even more immersive VR experience with 8K playback quality at unprecedented fluidity, clarity and resolution. Committed to becoming a technology-based entertainment giant, iQIYI attaches great importance to applying technological innovation to help it have a deeper understanding of its consumers, partners and drive the creation of high-quality content. As the world enters the 5G era, iQIYI will continue to focus on the creation of high-quality content and integration between technological innovation and content creativity to enrich its vast entertainment ecosystem. iQIYI, Inc. is an innovative market-leading online entertainment service in China. Its corporate DNA combines creative talent with technology, fostering an environment for continuous innovation and the production of blockbuster content. iQIYI’s platform features highly popular original content, as well as a comprehensive library of other professionally-produced content, partner-generated content and user-generated content. The Company distinguishes itself in the online entertainment industry by its leading technology platform powered by advanced AI, big data analytics and other core proprietary technologies. iQIYI attracts a massive user base with tremendous user engagement, and has developed a diversified monetization model including membership services, online advertising services, content distribution, live broadcasting, online games, IP licensing, online literature and e-commerce. For more information on iQIYI, please visit ir.iqiyi.com.